The Indian Point Interactive GIS Mapping System (IPIGMS) displays a location within a 10-mile radius of Indian Point and generates the evacuation route to the nearest reception center. Rockland County, New York, located approximately 30 miles north of New York City, is a suburban community with rolling mountains and sparkling lakes. Although Rockland County is known for its river villages and important contributions to early American history, most recently it has become part of a regional discussion about the safety of the Indian Point nuclear power plants in neighboring Westchester County. Since September 11, 2001, residents near the Indian Point nuclear power plants have been part of a fierce debate about whether to keep the plants open. The nuclear plants, which have been open since 1962, have been a significant source of power for residents and Businesses in New York as well as a major employer in the area. As of 2000, more than 40 percent of Rockland's 286,000 residents lived within a 10-mile radius of Indian Point. Citizens close to the plants worried about the plants' security. 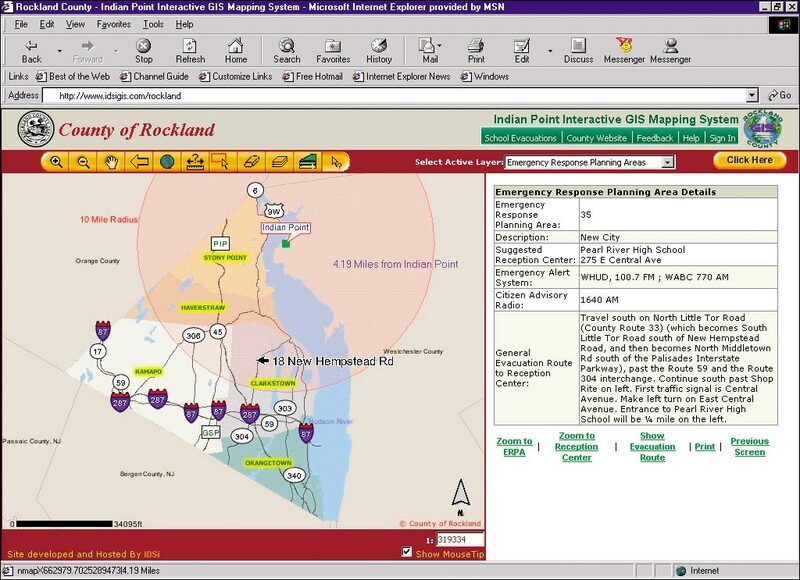 In light of the tensions, the county of Rockland, which is located across the Hudson River from the plants, believed it was necessary to design Web tools to improve the distribution, presentation, and quality of emergency planning information provided to the community. "It was clear that we needed a mapping tool that would enable residents to determine the emergency response planning area in which they live, find their corresponding public and school reception center locations, and other important emergency planning information," says county executive C. Scott Vanderhoef. Vanderhoef asked Rockland County Director of GIS Douglas Schuetz to evaluate Web technology options. This led to Esri Business Partner Intelligent Decisions Systems Inc. (IDSi) of Fort Lee, New Jersey. "Having an easy-to-use application was a key factor in our decision to work with IDSi to create this interactive mapping system because we wanted to be sure that residents would use it," says Vanderhoef. "IDSi showed us how ArcIMS and ArcGIS technologies could provide an application that provided a simple search feature." In addition, Vanderhoef and Schuetz saw that ArcIMS technology could easily be used to develop customized Web applications with Active Server Pages (ASP), ColdFusion, Java, JavaServer Pages (JSP), or ArcXML. This flexibility would make expanding the county GIS to include other potential Web applications and projects for the Highway Department, Department of Health (pesticide notification application), and the Board of Elections (polling station locator application) more efficient and cost-effective. 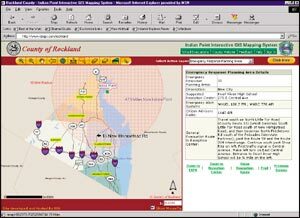 The county of Rockland unveiled the Indian Point Interactive GIS Mapping System (IPIGMS) in August 2002. The IPIGMS is a GIS designed to help residents identify their geographic location in reference to the Indian Point nuclear power plants. The interactive application guides users in identifying emergency response planning areas, evacuation routes, reception centers, and emergency alert system broadcast stations within their area. 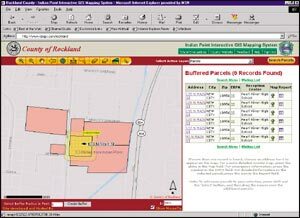 IPIGMS can generate various reports such as school evacuation, ERPA details, and parcel reports. From any simple Web browser, citizens can enter the site (www.rocklandgov.com) and see that a 10-mile radius buffer has been drawn around the nuclear site. This area contains the Indian Point Emergency Planning Zone (EPZ). The EPZ was divided into subsections known as Emergency Response Planning Areas (ERPA). The application was designed as a proactive planning tool to help citizens identify the ERPA in which they live, review suggested evacuation routes from a specific ERPA, determine which public reception centers are available to them, and learn the locations of school reception centers. User instruction and help guides are available on the site for first-time users. Specialized search criteria have been created to access locations quickly. Users can search for their places of residence or work by address; intersection; Property Identification Number (PIN); or section, block, and lot. Detailed information about school reception centers for school evacuations and directions to these centers are available on the site. "The interactive mapping feature now available on the county's Web site is a great tool for families who live in the Indian Point Emergency Planning Zone," says Rockland County director of Fire & Emergency Services Gordon Wren. "By using the feature, residents can be proactive in creating family emergency plans to use in the event of an emergency at Indian Point. We encourage all residents to have a family emergency plan in place, and this application certainly provides an easy way for them to do so." The IPIGMS uses multiple layers of data to create a comprehensive map of the EPZ. Users can define which data layers they would like to see active. The availability of other data layers, such as lakes and roads, provides local government with the ability to expand analysis of issues and provide additional services to the community. For example, the application could be slightly customized to help landscapers comply with the county's new 48-hour Neighbor Notification Law concerning pesticide application. Under this law, commercial lawn applicators must provide nearby residents with at least 48 hours advance notice of certain pesticide applications. Those requiring notification are occupants of dwellings with abutting property lines within 150 feet of the pesticide application. For pesticide application users, the service (requiring user logon and password) will provide landscapers with a complete report and set of mailing labels containing contact information and addresses produced through the defined search. 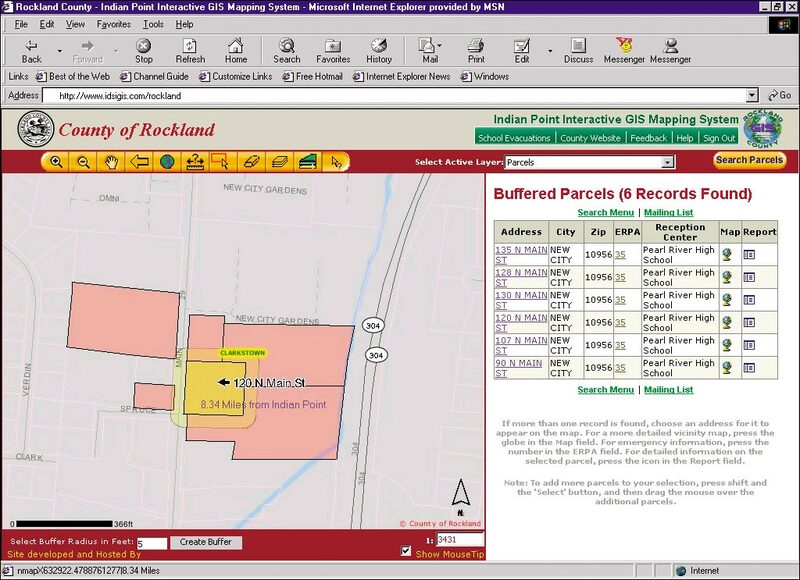 In addition to evacuation planning, the Indian Point Interactive GIS Mapping System provides authorized personnel access to advanced functionalities such as mailing list generation and printing. Defined reports based on specific views can also be created. For more information, contact Rockland County director of GIS Douglas Schuetz (tel. : 845-364-3421, e-mail: SchuetzD@co.rockland.ny.us) or Fawaz Patta, Intelligent Decisions Systems Inc. (tel. : 201-302-9494, ext. 118; e-mail: fawaz@idsigis.com; Web: www.idsigis.com), or see the live application at www.rocklandgov.com or www.idsigis.com/rockland.